A stray gunshot has a devastating impact for a young couple. Mark (Noah Wyle) is an over-worked editor, who is desperate to patch up a rocky stage in his marriage with psychiatrist Phoebe (Sharon Leal). High-schooler Miguel (Jorge Lendeborg Jr.) is being bullied by peers, and is desperate to find a way to assert himself. These two worlds collide when Miguel finds himself in possession of a handgun, and accidentally fires a shot. The bullet rips through Mark's upper lung as he walks down the street with Pheobe, leaving him bleeding out on the pavement. The film serves as a polemic for the firearm-related violence in the United States. This could not come at a more timely moment, as the US Congress fails to act even as the nation suffers the worst mass shooting by a civilian in its history in Las Vegas. Shot takes a brave decision to focus only on one stray bullet injuring one person, to show how on any scale gun violence can be tragic. Unfortunately it suffers the same problems as many 'issue' films, its arguments weakened by a lack of engaging plot and characters. 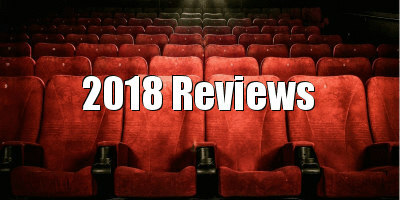 There isn't enough here to justify a feature-length film, and what is shown is dragged out to exasperating proportions. 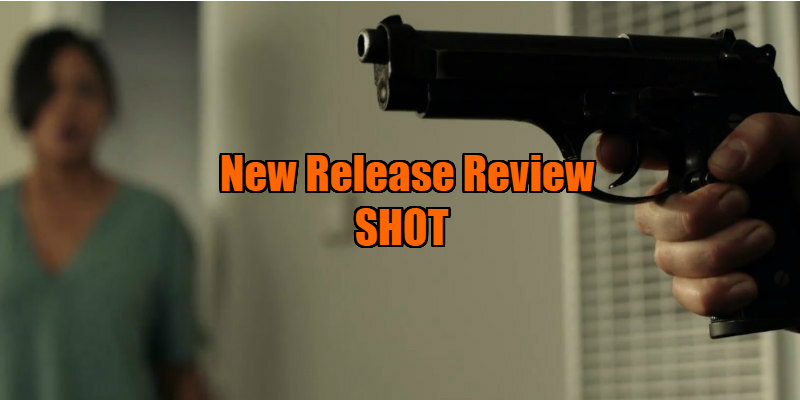 The gunshot is tragic in its randomness, and director Jeremy Kagan takes great pains to show how agonising and drawn-out the treatment process can be. Yet the audience hasn't seen enough to fully engage with Mark and Phoebe, and the next 40 minutes feels, well, agonising and drawn-out. A comparison might be The Death of Mr. Lazarescu, which while making another important social point can be paralysingly dull. Kagan tries some experimental visual effects, but none add to an audience engagement with the events at hand. For instance, in the first half of the film Miguel's life is featured simultaneously with Mark getting treatment using a split-screen. Yet it's only really possible to focus on one or the other, and too often there's nothing going on in either storyline. What could have been saved by a good musical score is hampered by an almost complete lack of one. The acting is somewhat insipid, especially in scenes involving Miguel. His scenes also seemed forced into some sort of redemptive arc, which did not seem new or inventive. Wyle, a long-time star of ER, is given the most to do of the three leads. Unfortunately for the first half of the film a lot of his dialogue is obscured by an oxygen mask, and what he does say is not particularly memorable. Where Mark does come alive as a character is in the months after the gun-shot, as he must learn to live with a life-changing injury and not take any anger out on Phoebe. While going into great focus on a single event relating to gun crime, Shot doesn't provide any clear solution to this problem plaguing the United States. The gun used in the drama is already illegal, for instance. The film does however provide comment for the normalisation of firearms in the US; Mark takes no issue as he edits scenes of a massacre at work, and even after his traumatic ordeal keeps a firearm in his home. Shot has its heart in the right place, and a final scene followed by advice on stopping gun violence in the United States are both affecting. Unfortunately what has come before it has been dull in long stretches, spiked with the occasional moment of melodrama. With this in mind it is hard to recommend the film, either as a dramatic work or as part of a campaign for social justice. 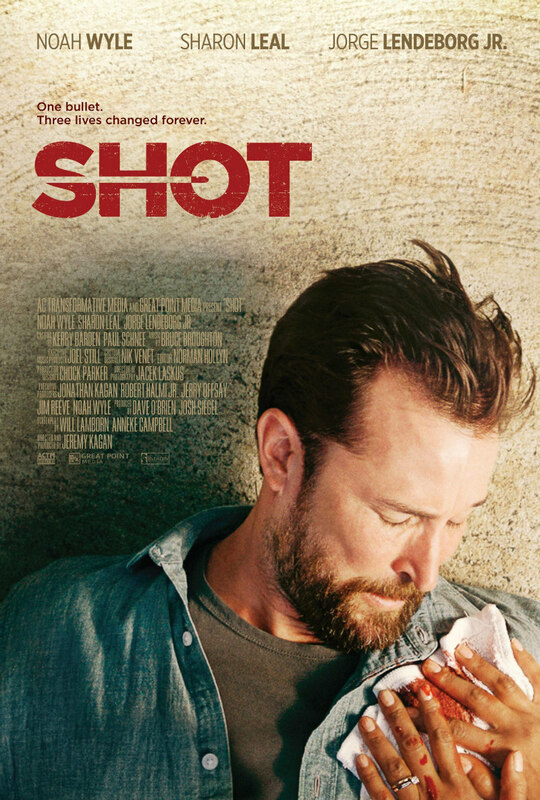 Shot is on VOD now.